Part I. A raisin in the sun ; The free write ; The fire next time -- Part II. The death of Ivan Ilyich -- Part III. Crime and punishment ; The lion, the witch and the wardrobe ; He wishes for the cloths of heaven ; Narrative of the life of Frederick Douglass ; I have read everything on this paper (the guilty plea) ; To Paula in late spring -- Part IV. Easter morning. Michelle Kuo arrived in the rural town of Helena, Arkansas, as a Teach for America volunteer in 2004, bursting with optimism and drive. But she soon encountered the jarring realities of life in one of the poorest counties in America. In this unforgettable memoir, Michelle shares the story of her complicated but rewarding mentorship of one student, Patrick Browning, and his remarkable literary and political awakening. Fifteen and in the eighth grade, Patrick begins to thrive under Michelle's exacting attention. However, after two years of teaching, Michelle leaves Arkansas to attend law school. When, on graduating, she learns that Patrick has been jailed for murder, Michelle returns to Helena and resumes Patrick's education as he sits in jail awaiting trial. For the next seven months they pore over classic novels, poems, and history, and Patrick is galvanized by the works of Frederick Douglass, James Baldwin, Marilynne Robinson, W. S. Merwin, and many others. 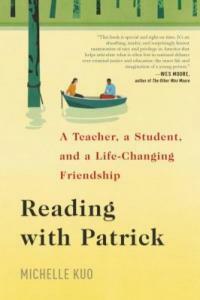 Reading with Patrick is an inspirational story of friendship, a coming-of-age story for both a young teacher and student, a resonant meditation on race and justice, and a love letter to literature and its power to bind us together. Fabulous book submitted by Sarahcaps on July 12, 2018, 8:46pm Very well written, inspiring and heart felt. Enlightening and deep. Important. submitted by terpsichore17 on August 29, 2018, 9:20am A carefully told story. Kuo, daughter of Taiwanese immigrants and Michigan native, did a stint with Teach for America after college and before entering law school. Her time in Helena follows the typical (so far as I’ve heard) trajectory of TfA stories: I came, I was shocked by the economic realities of this area, I used trial and error until I found some writing exercises and reading materials that these students connected with, we conquered. The less-typical part is how the narrative goes on: the school lost funding, I decided to go to law school, I learned just before graduation that one of my quietest students was in jail for killing someone. I went to see for myself what had happened, I elected to stay nearby, I kept my student reading and writing throughout the wait for a trial and as long as I could thereafter. Kuo notes the difficulty of finding a place for the Asian-American within the narrative of the United States, and how she studied African-American history as a sort of surrogate. She’s initially surprised to find that her students don’t connect with the writing of Malcolm X or speeches of King as much as she did. The entire book is very self-aware, edging on too self-conscious at times; Kuo doesn’t want to shortchange the influence of teachers, nor would she deny the autonomy of students, nor can she obscure the difficulties inherent in their community and background – particularly given the effects of historical and systemic racism, throughout the country but especially in the community of Helena. Overall, an excellent, ofttimes moving, sometimes difficult read. Patrick’s poems and letters, occasionally shared as Kuo relates her sessions with him, are among the most beautiful and moving aspects. Opportunity Lost submitted by gclites on December 30, 2018, 12:18pm well-written, extremely introspective, lots of references to other good literature. My over-riding impression is what opportunities did the author forego to spend so much time with Patrick. How much good did this do Patrick? Was there any impact on Helena, Arkansas? What is the purpose of the book -- to make readers aware of the tragic situations in "forgotten" places in the US or to make the author feel like her efforts meant something? The book is a memoir, not a call to social justice. Description: xxi, 296 pages ; 22 cm. Prisoners -- Books and reading.